Easter Bunny Bark that can be made with any chopped up Easter candy and then pressed into melted white chocolate: super fun and sweet dessert for the holiday! This is easy to make and would be great to give as Easter gifts in little cellophane bags. Happy spring and happy Easter! It was 60 degrees here yesterday in Rochester, NY! This is so very hard to believe after we had 5 inches of snow not even 3 days ago. Spring has me thinking about Easter which is less than 3 weeks away (yikes!). Of course, since my thoughts constantly revolve around food, Easter food makes me think of candy. 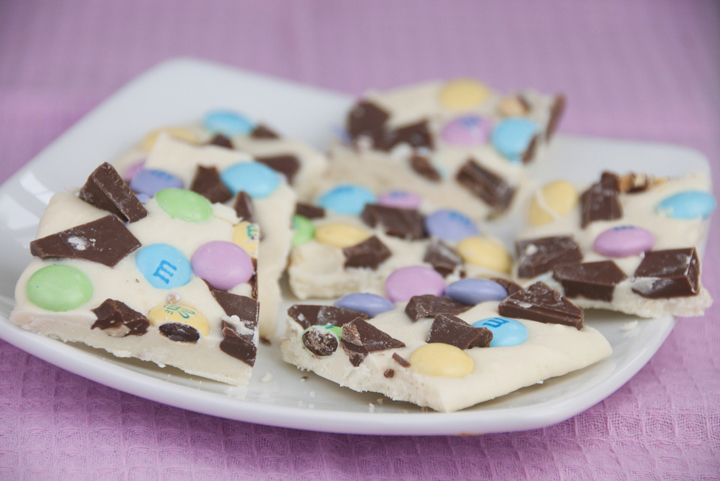 Candy makes me think of this Easter Bunny Bark. 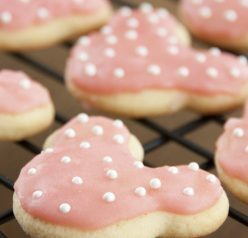 This is so easy to make and everyone will love this: kids and adults alike! The colors in this bark are so fun and just very welcoming for a spring dessert. 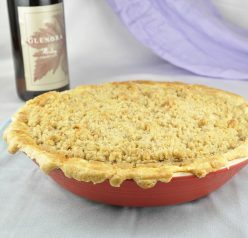 It would be so pretty sitting on your Easter food table or at a spring birthday party. 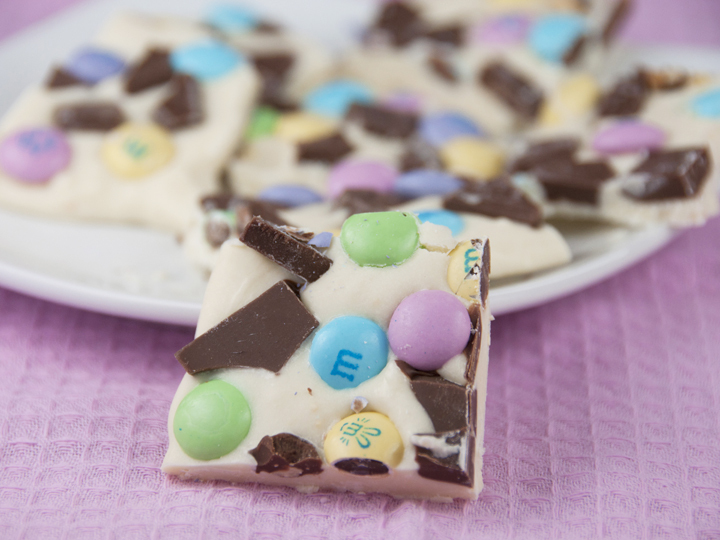 This Easter bunny bark can be made with any Easter candy that you prefer (it doesn’t even necessarily have to be Easter candy, really). 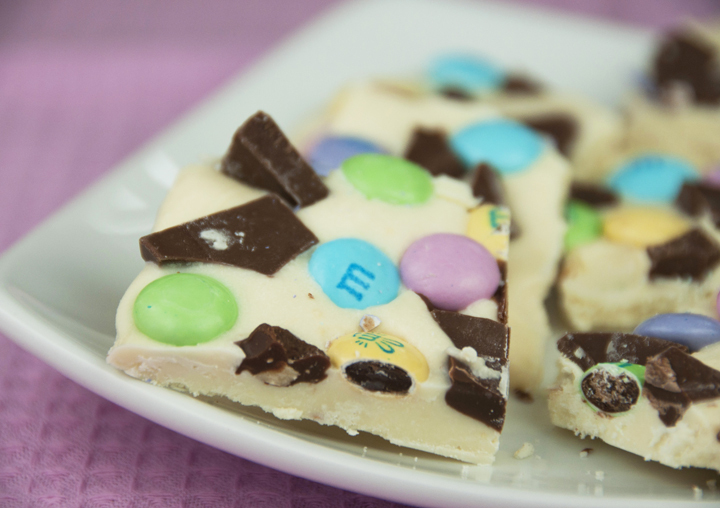 Robin Eggs, chocolate Easter bunnies, chocolate covered marshmallows, Cadbury eggs, pastel jordan almonds, jelly beans, and spring colored M&M’s are just some of the endless possibilities you can insert into this bark. You can even customize it to whatever holiday you are making it for. I love how adaptable this recipe is! I’m thinking red and green M&M’s for Christmas maybe? I’m a lover of white chocolate so this one will be made very often. Have fun with it, make it it your own, and enjoy! If you like fun Easter treats, be sure to check out my Salted Caramel Easter Popcorn. The Easter popcorn gets devoured in two seconds every time I make it. Also, a popular recipe with my friends are these Coconut Macaroon Nutella Nests. I think the macaroons are my most popular Easter cookie. If you’re looking for more cute and easy Easter treats, be sure to check out this Easter Candy Milkshake from my friend Amy. 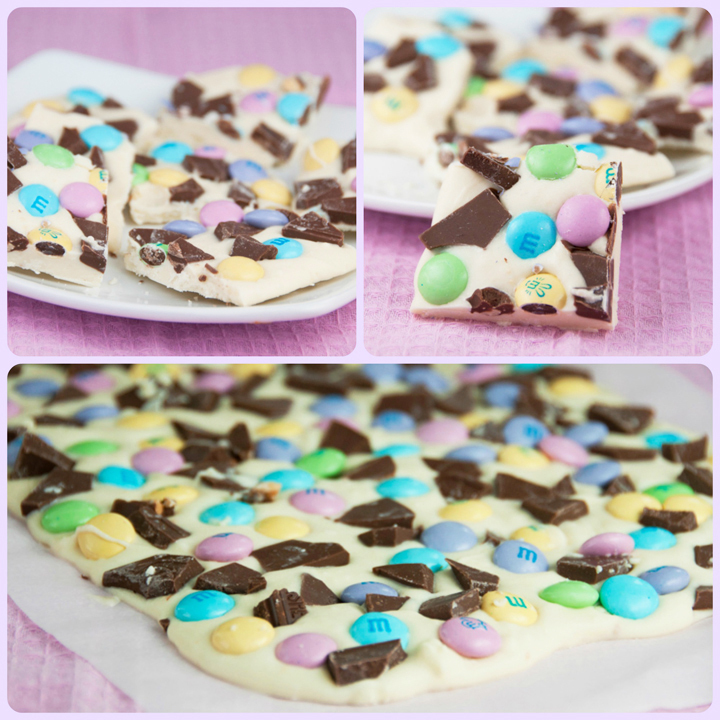 Easter Bunny Bark that can be made with any chopped up Easter candy and then pressed into melted white chocolate: super fun and sweet dessert for the holidays! This is easy to make and would be great to give as Easter gifts in little cellophane bags. Begin by roughly chopping the candy. Line an 9 x 11 (or close to it) pan with parchment paper. Microwave for 15-30 seconds and stir. Continue to microwave chocolate for 15-30 seconds and then stir until chocolate is completely melted. Do not microwave for more than 30 seconds or chocolate will scorch and clump! White chocolate is very funny like that! If you run into trouble and chocolate clumps, I found a trick that works: melt a couple tablespoons of butter and pour the WARM butter (half of it, more if needed) into the chocolate and mix together. The white chocolate will magically become the consistency you need it to. Pour melted chocolate onto parchment paper and spread evenly with a spatula. Mine didn’t completely come to the edges of the pan but that’s OK! It doesn’t have to be perfectly square since you will be cutting it up anyways. Begin placing Easter candy into the white chocolate. Press the candy down a little into the chocolate so that when you cut the bark, the candy stays in place and doesn’t pop out. Let the Bunny Bark sit for several hours until it hardens. If you’re in a hurry, pop it in the fridge for 30-60 minutes. Make sure it’s completely hardened. Transfer bark to a cutting board. Cut the bark into squares (however large you wish) with a large, sharp knife. I still have some of that, too! haha. 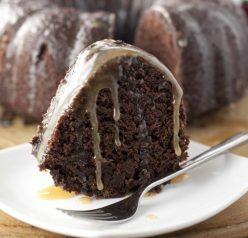 I love that this only needs 2 ingredients! That Easter bunny better watch out… this beautiful bark is all mine! Hehe. I know – I love that too!! Thanks Georgia! Thanks Heather! I bet they will! This is easy (too easy! ), pretty, and most of all, flavorful! What more could I want? Well, nothing except to make a batch for myself! This is great — thanks. Such a sweet festive treat for Easter! I’ve been putting off getting easter candy because I know I can’t help myself. Haha However, this bark looks so yummy that I may have to indulge early. Clever idea, Ashley! Love this idea, Ashley! 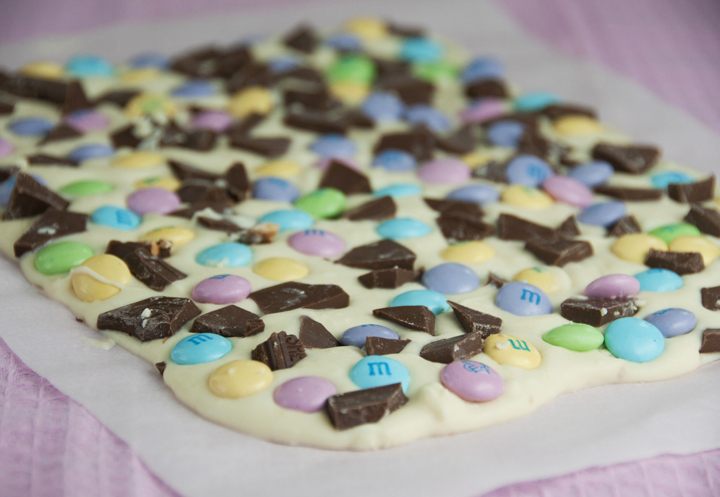 Easter candy makes the prettiest candy bark! This is cute, I think making some by making the white chocolate into pastel colors would be a cute idea as well! I’m crazy for bark so this recipe has got me all worked up. What a treat! I love this bark – adorable – and I love the name of it too! So cute! Pinned! I WOULD NOT be able to contain myself around this stuff!!!!! I don’t know that I’ve ever heard a bunny bark. Okay that was lame. Yep this is easy alright. Great since EAster is crazy busy. I love creating different variations with bark. I’m sure this was a HUGE hit among all the kids and adults. Fun recipe! Love this colorful Easter candy, it’s a great welcome gift for spring.